This app gives access to national soils data and gives farmers the information they need to manage their land better. Years of knowledge and research by the James Hutton Institute are now at everyone’s fingertips thanks to the Institute’s first iPhone application, introduced at the Winter Potato Meeting of the Scottish Society for Crop Research on 14 March. SIFSS (Soil Indicators for Scottish Soils) is a free app aimed at growers, farmers and land managers in Scotland that allows them to find out what soil type is in their area. It is available for download on the Apple App Store. The app enables users to explore the characteristics of around 600 different rural Scottish soils; helping them discover the differences in soil characteristics between cultivated and uncultivated soils, and also to examine a range of key indicators of soil quality. The James Hutton Institute and its predecessor organisations have been collecting data on Scotland’s soils since the 1940s, resulting in a library of information on over 13,000 locations and over 40,000 individual samples. This information has been summarised into the Scottish Soils Knowledge and Information Base (SSKIB) which can be accessed through SIFSS. During the meeting, held at the James Hutton institute in Dundee speakers from several organisations touched on subjects related to the issue of agricultural intensification and the challenge of providing food for a burgeoning global population. Dr Andy Vinten, principal catchment scientist at the James Hutton Institute, reported on a method for capturing soil erosion from the aftermath of potato cultivation using modified sediment fences; while Dr Mark Stalham, from Cambridge University Farm, presented findings about depth of potato cultivation and the potential for optimisation of the process. Jamie Harrison, board member of North Norfolk Potato Growers (NNPG) and chairman of the grower-funded body, presented on-farm results demonstrating real improvements in potato production through reducing inputs while maintain yields and tuber quality. Reduced inputs in areas of fertiliser levels, machinery passes, reduced carbon footprints and improved tuber size range all contribute to increased crop profitability for growers. Plant pathologist Dr Alison Lees, from the James Hutton Institute, spoke about the role of diagnostics in managing soil-borne potato diseases and Dr Roy Neilson, rhizosphere ecologist at the James Hutton Institute, described a tool for the identification of free-living nematode communities and their role in monitoring soil health. SIFSS stands for Soil Indicators for Scottish Soils. The app is compatible with iPhone 3GS, iPhone 4, iPhone 4S, iPhone 5, iPod touch (3rd generation), iPod touch (4th generation), iPod touch (5th generation) and iPad. It requires iOS 5.1 or later, and it is optimised for iPhone 5. The app was produced with support from the eSMART (Environmental Sensing for Monitoring and Advising in real-time) project. 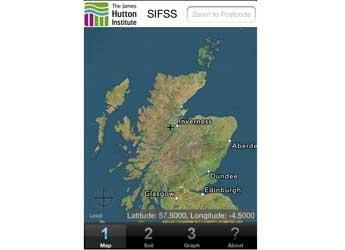 The app uses spatial data and databases developed at the James Hutton Institute and its predecessor institutes. The attribute data in these tables come from SSKIB (Scottish Soils Knowledge Information Base) developed by Dr Allan Lilly and the app was developed by David Donnelly. The app uses the device’s GPS and mapping to allow a user to choose a location and then connects to SIFSS servers to retrieve the relevant information from the soils database. Results are displayed in graphs. SIFSS can be downloaded from the App Store. For other non-Apple devices, there is a web-based interface of SIFSS available which is also free to use.